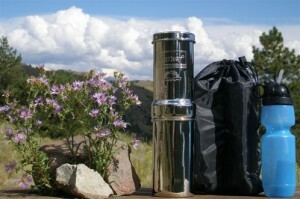 The Go Berkey Kit water purifier is a very popular for individual or very small group hiking and camping. The Go Berkey Kit is best for hiking, backpacking and emergency pure water. It comes supplied with (1) Sport Bottle, (1) Primer, (1) Carrying Bag and (1) Purification Element (Which means it's fully loaded.) You may add additional Purification Elements in the drop-down box below. Portable Water Purification System That Packs a Punch! The Travel Berkey is the smallest and lightest stainless steel water purifier in our line. The only smaller water purifier is our Sport Bottle which comes in this kit, and is most definitely an individual use product. If you like camping and hiking this may be the perfect combo system for you. This small water purifier is really intended for use by only one or two people, but it can purify up to a gallon of water per hour so you could keep a small group hydrated if you really had to. Like it’s larger purifier cousins it’s also made of 304 Stainless Steel (the same material used in food service, hospitals and professional kitchens) so it is built to last and ready for some rough backwoods hiking and camping. Yeah, it’s small, but with one “Black Berkey Purification Element” inside it can actually purify up to 3000 gallons of water! Not bad for a very compact yet sturdy water purifier. The stats below tell more of the story and the table gives you a sense of how this water purifier compares to others. 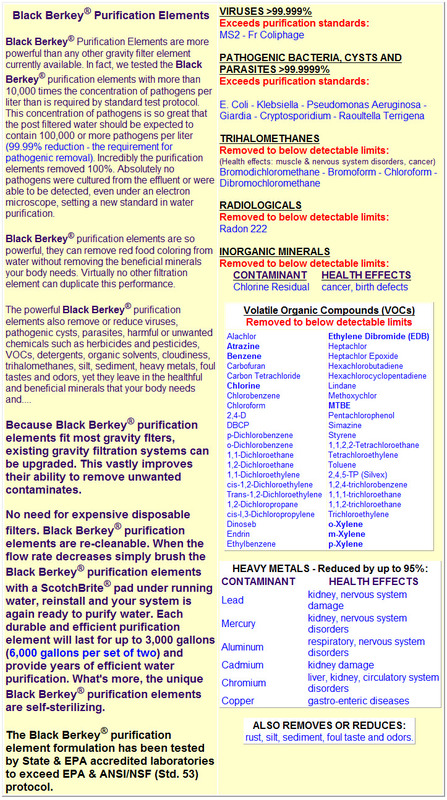 Since the Go Berkey uses the same purification elements you can purify any “raw water” you find in lakes, rivers, stagnant ponds, streams, rain, even swamps, etc. That kind of purification power can really come in handy…yeah we hike the back country too! This compact water purifier both filters and purifies water to get rid of all the “nasties” (pathogens) like giardia, cryptosporidium, heavy metals, and even gets rid of bad tastes and odors…(See the Specifics Below.) Water pressure is not required to enjoy clean and pure water with the Go Berkey water purifier. Just fill the top chamber with whatever water you can find and it uses gravity to pass the water the micro-pores of the purification element. If you’re out fishing or hiking you can literally fill it from the stream or lake and drink it pure water on the spot! This makes the system very practical for outdoors-men. To purchase the Go Berkey Water Purification Kit (which includes a Sport Bottle and a Carrying Bag,) just click on the “Add to shopping Cart” button and enter your payment details. All transactions are encrypted and secure. The water purifier kit comes with 1 Black Berkey Purification Element, but you may want to add a few more to your order for backups and to increase how much water you can purify. You’ll be glad you have this little purifier with you when you need it and may actually use it to rescue a back-woods buddy someday…maybe even you!